But how do I take down the chopper? Putting together a game takes lots of work from developers, artists and writers. But gaming companies also put great stock into gamers who take advantage of demos and beta releases. Beta releases are usually advance versions of games that aren’t fully formed, but the development team wants to test out particular aspects of the overall gameplay. Demos are often limited versions of what the full game will ultimately become. Patrick Bach, a senior producer at game developer DICE, said his company went “old school” when putting together its latest release, “Battlefield: Bad Company 2” (Electronic Arts, DICE), which goes on sale today. Bach points out that betas and demos are about more than just getting feedback from testers. Tracking software can show what gaming elements are being used, how gamers are using them and what impact they have on the overall feel of the game. He said often gamers will tell them what they think about a particular element, but the stats show a different story. It is meshing the two types of feedback together that helps developers create a more enjoyable game, he said. “It is super important to find the balance of fun and fair,” Bach explained. He called it the “rock, paper, scissors balance” where no one element overpowers another. “Battlefield: Bad Company 2,” a first-person shooter war game, took two years to get from drawing board to a ready-for-shelf product. During that time, Bach said his team worked on making the game fair, but never really knew how fun it would be for the players until they got important feedback from them. The DICE team kept close contact with their entire community and blogged updates to keep their fans in the loop. DICE did do some minor tweaking with weapons and vehicle handling based on suggestions from the play testers. But the company is quite pleased with its final product, he said. 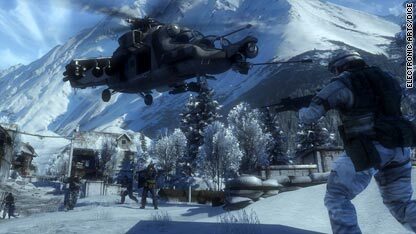 “Battlefield: Bad Company 2” is available for the Xbox 360, Playstation 3 and PC. Usually the games work out pretty well, in the beginning. Eventually it'll boil down to a huge steaming pile, after cheap strategies come in. So long as they keep balancing the game to keep these cheap strategies out, I'll be happy. Remember the endless grenades bombarding your spawn in BF2? Ya, I don't want to see anything like that ever again. we picked up the game today. My son is very excited about it. Im picking up my copy today! This will be a good test for my Windows 7 install via BootCamp on my MAC. I've been waiting for an excuse to stop playing Battlefield 2! I preordered this through ea through digital download. Unfortunately i cannot install it as the installer is corrupt or incorrect and trying to get customer support through ea is impossible. I cant even get a refund either. EA is not on my good list. Bought the game through D2D. It works fine. I had no issues with installation. I was totally oblivious to the fact that this game was so new. I was just surfing through D2D's website looking for a good game to try and found this one. So far it looks great in single player though very linear (Note: I am perhaps 45 minutes into the game so take my comment for what they're worth). The only trouble I've had is that I have a code for some special item (came with the purchase at D2D) and I can't seem to redeem the code. No worries. I only spent 5 mintues trying to figure it out. I'm sure I'll figure it out. Love the game so far. DICE/EA did a good job on the gameplay. I just wish they had given us diehards that pay for rented-dedicated multiplayer servers better tools right from the start to help us keep the games/matches fair and fun. I just love how EA employees spam this thread. I will not buy Electronic Arts product and I have sold all my ERTS shares. Google any of Electronic Art player supported forums and find out why for yourselves. I played BF1 When it first came out and it was great. I played Bf2 at a friends house and it was even greater. DICE has a good concept on gaming and i can't wait for the 3rd one to coem out... if it does. I've owned and disliked many EA games in the past. However I did enjoy Battlefield 1942 and Battlefield 2. With that being said Battlefield Bad Company 2 has surpassed my expectations and everything does seem to be balanced and fixed. -Spawn camping=difficult to achieve due to being able to spawn on-top of your squad-mates and the ability to join a new squad at any given point. Your entire team would have to be locked down, and if that happens spawn camping most likely isn't the problem. -The maps=Probably one of the most important elements of an FPS, and I've had a great time on every map and I've enjoyed all Conquest+Rush game types. -The guns=Right now the ranking system, to me, is vastly superior to that of COD:MWF2. The guns themselves are very enjoyable to shoot. This is due to fixed hit boxes and appropriate 'bullet drop'. However, what I've noticed makes this game unenjoyable for some is that they have not taken the time to learn how to play this game effectively. Spotting enemies=Crucial (Lrn2use back button...), Switching to a dead enemies kit=Useful to save a teammate or repair/destroy a vehicle, flying the UAV and making use of all vehicles, and etc. The biggest issue I've experienced currently is the servers, this close to release, have been somewhat of a hassle. Being dropped from games, unable to connect to EA servers/unable to join games. I've also heard of people losing stats due to server issues. I'd expect for this to be fixed within a couple of days to weeks. However, at the moment it is an issue, but that's not to say its this way the majority of the time. I loved the original COD:MWF the second one was disappointment. However BF:BC2 has been an absolute blast and I highly recommend it. I easily give it a solid a 10, a fanboy rating mind you, but I cant find anything to detract from the game. So many people speak ill of video games. Most of you who are saying "EA/DICE is a horrible company" are probably playing games like MW2 and WoW. I play WoW and DAoC and I try not to speak down on any games unless it is pointless. You must understand that not every game is going to be perfect. And what you would do if Obama passed a law that no video games can be played... You must look at the fact that they are trying and succeding. This game is awesome 10/10. I have had no problems with the beta or the full version witch I am playing on PS3, See you on the Battlefield. I have the three previous games in this series, Battlefield 1942, Battlefield 2, and 2142. I have enjoyed all of them and still play them to this day. I have not yet obtained the new releases. However, that being said, there is one issue that I do have with the Battlefield Series, the equipment such as Aircraft, (Battlefield 2 and 2142), are very tempermental in their flight abilities. Something that I hope has been rendered a moot point in the new releases. Also, the other issue that I have is that of the Sniper Rifles, in all of these games. Folks at EA, this is for you. When you take a head shot with your Sniper Systems, they need to terminate the character with the first hit, PERIOD! I can understand a character in the game surviving a body hit. This happens on the real life battlefield too, but a head shot is always a death note. At any rate, see all of you in the game!